With the 2019 Manila International Auto Show around just two weeks away, it’s interesting to see which brands are present and which ones are not. 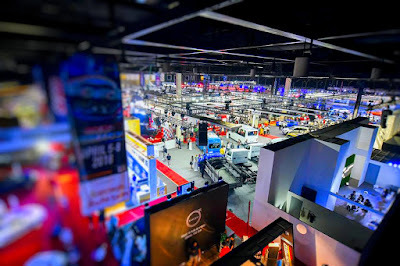 Since we happen to see a copy of the floor plan, we can tell you for sure which brands will be displaying their wares this April 4 to 7, 2019 at the World Trade Center in Pasay City. In the Main Hall, the following brands will display (in order of pavilion designation): Ford, Motul, Jeep/RAM, Hyundai, GAZ, GAC, Subaru, Suzuki, Jaguar/Land Rover, Mitsubishi, FOTON, Volkswagen, Kia, Nissan, Sea Oil, BPI, MG, Chevrolet, JAC, and Petron. With that in mind, the notable absences are mainly the Japanese brands: Honda, Mazda, and Toyota and some luxury brands like Audi, BMW, Lexus, Mercedes-Benz, MINI, Porsche, and Volvo. It’s understood that Worldbex Services International, the organizer, has capped the size of the pavilions to around 600 square meters in order to accommodate more brands in the Main Hall, but that didn’t stop Hyundai from booking the biggest space at 680 square meters. After Hyundai, Subaru has the next biggest space at 632 square meters and rounding out the Top 5 are Ford and Nissan on equal footing at 493.75 square meters, and Suzuki at 353 square meters. This year, there won’t be any off-road experiential activity at the North Wing front lawn. Instead, truck and bus brands will fill it up: JAC, Hyundai, Ural, Foton, Tata, Impenetra Armor, JMC, Pioneer Trucks, and Isuzu. Interestingly, Isuzu will have another display but this time facing the West Wing (Macapagal Avenue) near the MIAS main billboard. With the World Trade Center and the surrounding Philippine Trade Training Center (PTTC) undergoing extensive renovations, MIAS this year is limited only to World Trade Center’s four Main Halls as well as the two adjacent East Wing A and East Wing B tents. These tents will house aftermarket vendors and the Classic and Custom Car Competition. Finally, as for new car launches, it’s been confirmed that Kia and Jeep/RAM will be unveiling something new at the show. However, there’s strong buzz that brands like Hyundai, Nissan, MG, and Chevrolet will also have something new at MIAS.